Cutoff wall system containing bentonite & Portland cement to isolate pump station excavation. Additional continuous cutoff wall of 25 foot depth connected to pump station cutoff wall for intake canal. 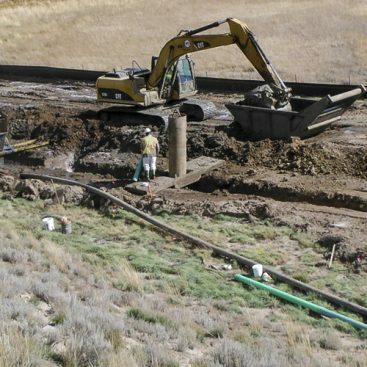 Geo-Solutions was subcontracted for the installation of a cutoff wall system to surround a pump station and intake canal excavation. 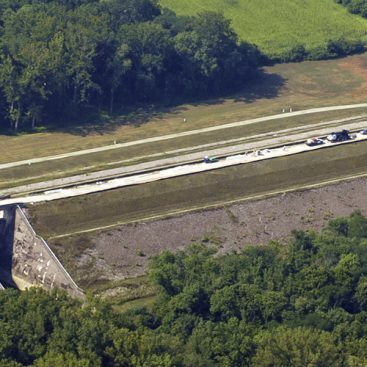 The system includes a SCB cutoff wall at a depth of 40-feet to surround the pump station and a SCB cutoff wall at a depth of 25-feet to surround the intake canal immediately to the north of the pump station. The intake canal cutoff wall will tie into the pump station cutoff wall in two places. The SCB wall was designed to reduce the seepage of water into a large 120,000 SF pump station excavation from an adjacent canal. The cumulative length for both completed cutoff walls finished at 2,870 linear feet with approximate width of 2.5 feet and depths reaching 40.0 feet below ground surface surrounding the pump station and 25 feet below ground surface around an intake canal. The total vertical square feet of trench excavated finish at approximately 100,000. 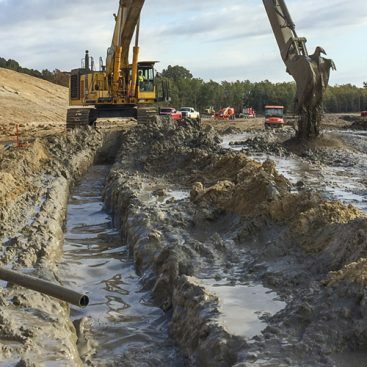 The project specifications required the use of a SCB trench using slurry trenching method. 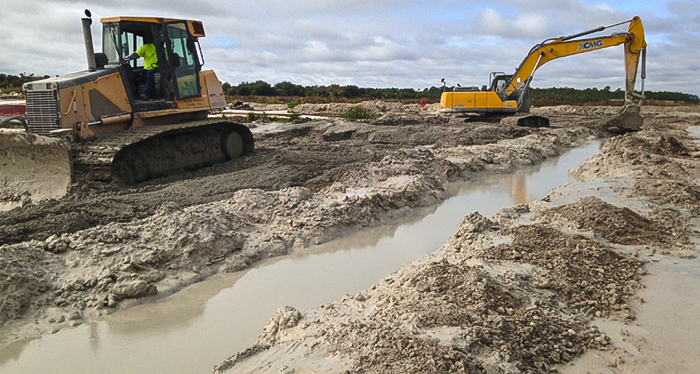 Geo-Solutions used a bentonite slurry during excavation at approximately 6% by the weight of water. A rock trenching machine was utilized to cut through the top layer of cap rock prior to excavating the slurry trench. Once the trenching machine advanced, the trench was excavated using a Komatsu PC800 equipped with a long stick and boom capable of reaching the required 40 feet. The trenching bucket is equipped with specialized ripper teeth designed to excavate through any rock that may be remaining within the trench. Because the cutoff wall is immediately adjacent to a canal, the work platform was reasonably narrow and required a narrow SCB backfill mixing area. Excavated spoils were stacked adjacent to the slurry trench and a bulldozer, medium sized excavator, and Longstick excavator were used to combine the spoils with bentonite slurry and Portland cement. Slurried bentonite was produced in a nearby pond with water located in the open excavation. 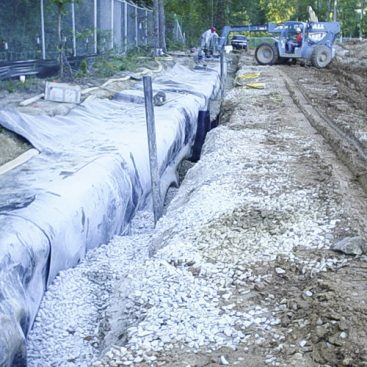 The slurried bentonite was pumped through HDPE pipeline to the trench during the excavation activities. Portland cement supersacks were placed along the backfill mixing area. An excavator was used to mix the dry cement with the spoils and slurried bentonite along with the bulldozer to blend the backfill thoroughly. The backfill was placed into the trench using an excavator to form the permanent cutoff wall. Hard rock layer required the use of a trenching machine prior to the cutoff wall construction. Porous rocks were consolidated by the trencher, reducing the amount of material for backfill. Increased liquid content in material and lack of dry material required more time and work to create consistent backfill. Voids encountered while excavating dropped slurry levels on multiple occasions requiring time and additional slurry to allow slurry levels to return to normal. Calcium and lime in the limestone rock reduced viscosity and required additional bentonite to be used. Groundwater infiltrated into trench multiple times over long weekends requiring increased bentonite concentration.